How to Train Your Dragon 2 was one of the biggest animated hits of last year, taking in $177 million domestically and over $618 million worldwide. That sequel will lead into How to Train Your Dragon 3, which Paramount has set for release in the summer of 2018. 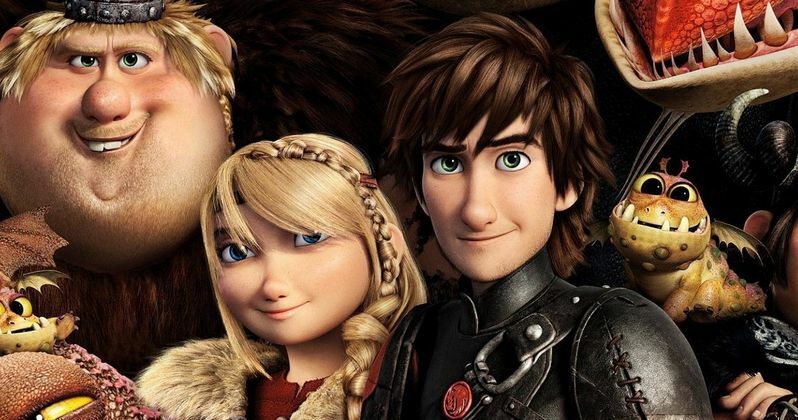 The How to Train Your Dragon franchise is based on the children's book series by Cressida Cowell, although the movies took a much different approach, following the adolescent years of Hiccup Horrendous Haddock III, instead of his journey as an adult in the books. During the VES Awards earlier this week, How to Train Your Dragon 2 director Dean DeBlois teased that How to Train Your Dragon 3 will end where the books begin, and that the sequel shows Hiccup's coming of age. "[Dragon 3 is] the culmination of Hiccup's coming of age. Both he and Toothless are now chiefs of their respective tribes, and it's a dueling story where you have both characters trying to do what's right for their kind, and an eventual outcome where Hiccup is able to stand on his own. We're gonna take the story to where the books begin, which is Hiccup as an adult reflecting back on a time where there were dragons, suggesting that the dragons will in some way go away. Why and could they come back and the mystery of what all that is will be saved for the actual story." The filmmaker seems to be hinting that Hiccup (voiced by Jay Baruchel) may end up parting ways with his beloved dragon Toothless by the end of this sequel, although it isn't known how the transition will be made from this younger Hiccup to the adult version in the books. The writer director also added that How to Train Your Dragon 2's villain, Drago (voiced by Djimon Hounsou), wasn't originally set to debut in the sequel, since the filmmakers wanted to save him for How to Train Your Dragon 3. Dean DeBlois added that fans will learn much more about Drago in the upcoming sequel. "You have to wait until the third film to actually see where Drago's character goes. He's a lot more complex than he's presented in this second installment." Dean DeBlois is currently writing the script for How to Train Your Dragon 3, revealing that he has written 60 pages thus far. "There were a few months of pitching outlines and making sure that everybody was content with where it was headed, and now I'm deep into the script. I'm about halfway through. I was literally working on it this afternoon before coming here. I have to hand it off pretty soon."